During the past few days I have been making my way around West Virginia, holding meetings in Wheeling, visiting Catholic educators in Morgantown, holding further meetings here in Charleston, and now offering Holy Mass here in the Basilica Co-Cathedral dedicated to the Sacred Heart of Jesus. Although I am officially designated by the Pope as the Apostolic Administrator of the Diocese of Wheeling-Charleston, I shall strive simply to be your “interim pastor” as you await the appointment of a new bishop. And even if the circumstances that brought me here are indeed difficult, it is a pleasure to serve you and the Catholic community in the State of West Virginia, and let me thank you for the warm welcome I have received everywhere I have gone. Animated by faith, anchored in hope, and filled with joy in the Holy Spirit, we are equipped to embrace the Cross whenever and however it asserts itself, whether in our personal lives or because of some persecution the Church may suffer. But the heaviest crosses are often those that arise from infidelity within the Church, especially on the part of those we trusted as our shepherds. It is this that is causing so much ‘grief and anguish’ in the Church— here in West Virginia, throughout the United States, and in many parts of the world. It is this ‘grief and anguish’ which I, as your pastor, must take to heart. 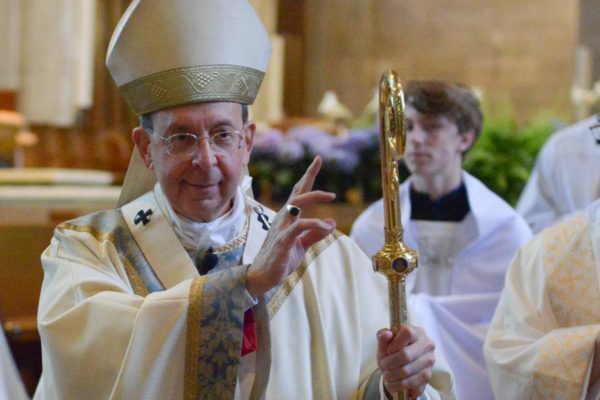 So, while I am happy and deeply honored to be among you, I also share your sadness over the circumstances that brought me here, especially the investigation into your former bishop, Bishop Bransfield, whom we should continue to keep in our prayers. As you know, harassment allegations have been made in his regard and a highly qualified lay investigative team is already looking into these matters. My task is to oversee and conclude that preliminary investigation and communicate its results to the Vatican – something I hope will soon be done – so that we may prepare to identify and welcome a new bishop for this, your diocese. In the meantime, you find yourselves grappling with the horrid picture of abuse painted by the Grand Jury Report in Pennsylvania, and by similar reports that will be issued elsewhere in our country. Like you I am deeply disturbed as well by the McCarrick scandal & with you I wonder how someone guilty of such behaviors could rise so high in the Church’s ranks. Understandably, all this has led to a crisis of trust in Church leadership and to demands for greater accountability of bishops both for their own conduct and also for failing to handle allegations of abuse candidly and thoroughly. A number of action steps are on the table at the November bishops’ meeting, including a national third-party reporting system for allegations against bishops, as well as the development of a code of conduct for bishops. The bishops plan to do an investigation here in the U.S. of Archbishop McCarrick and just today Pope Francis announced that the Holy See would also undertake its own investigation of his case. These steps are but the beginning of a long process of restoring trust and credibility, bringing about healing, and refocusing the Church’s energies on spreading the Gospel and serving the poor, even as we remain steadfast in protecting the innocent and the vulnerable. You, dear friends, are also very much a part of this process of healing and restoration: first by all you have done and are doing to create a safe environment for children and young people in parishes, schools, and other ministries. You do this by your compliance with policies on training, background checks, and the immediate reporting of all allegations to civil authorities. For all you are doing in this parish and throughout the diocese to protect children and young people as also to offer support to victims of abuse, I thank you with all my heart. There is another way you and I can help rebuild and heal the Church, locally & beyond. It’s by living faithfully our God-given vocations – mine as a priest and pastor of souls – and for most of you, the all-important vocation to marriage and family. It is this vocation of yours that is highlighted in this evening’s Scripture readings. By living the vocation to marriage and family with fidelity and generosity, your homes become what are called “domestic churches”, “little churches”, holy places where young people are brought into the world, where they are nurtured, formed in faith and virtue, and equipped to embrace their God-given vocations. In good and loving homes young people are formed to be the persons God intends them to be. The home is where we learn to treat others with respect and to love them with a generosity and goodness that reflects God’s own generosity and goodness. And so it is that your homes, as domestic churches, build up the parish community, and the larger church, and the wider culture of which we are a part. To see this point more clearly, let us remind ourselves what Jesus told the Pharisees when they challenged him as to whether or not Moses permitted divorce. In response, Jesus showed them and shows us God’s original intent for our humanity. The union of husband and wife is meant to be a sign of God’s desire to be one with us, a sign of the very reason why God created us human beings in the first place: God wants to share his love with us and God wants us to share our love with him. Thus Jesus teaches that God’s desire to be one with each of us and with all of us is the standard both for marriage and indeed for other human relationships. In turn, the love of husband and wife is a uniquely important sign of that love which Christ has for the Church and which he extends to all people of good will . . . a love that is faithful, lasting, and fruitful – the essential qualities of married love – the very qualities that make house into a home and a home into a domestic church. What’s more, the love of husband and wife provides in God’s plan a model for the way in which we, your pastors, should love you, the People of God. We should love you with a love that is faithful and lasting, indeed a love that bears good fruit in works of holiness and service to others. As priests and bishops we are called, not just to love our jobs, but enter into a deep union of love with the Lord and with you whom we are privileged to serve in the Lord’s Name and Person. And so, the standard for marriage that the Lord holds out to us in tonight’s Gospel applies also to us, your priests, who are called to love you by living celibacy chastely and fruitfully . . . if only we are willing to abandon that hardness of heart that can so easily overtake us. Regretfully the hardness of heart that Jesus condemns in the Pharisees has surfaced in the lives of some clergy who have compromised their commitment to celibacy and who have even gone so far as to harm gravely the children whom Jesus loves so tenderly and purely. Such obstinacy to God’s grace is shared by bishops who failed to address the infidelities of their brother bishops and priests forthrightly. For our hardness of heart, we, your shepherds, ask not only for your forgiveness but we also ask God for the grace of a broken and contrite heart, the grace of sincere and lasting repentance before God and before the Church. 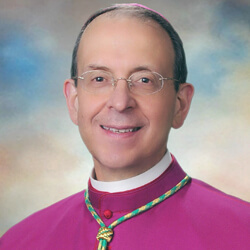 For, at the end of the day, the only way the Church will heal, the only way that trust will be restored, and that vigor will be restored to the Church’s mission is for us, your bishops and priests, to live our vocation faithfully, and indeed, for you to live your vocation with renewed generosity and joy. In a word, healing the Church demands that all hands be on deck. This is what the Lord is calling us to as this particular Sunday dawns upon us. May the Lord grant us all the grace of healing, reconciliation, and renewal – so that his love and goodness might shine more brightly in us and through us . . . and may God bless us and keep us always in his love!